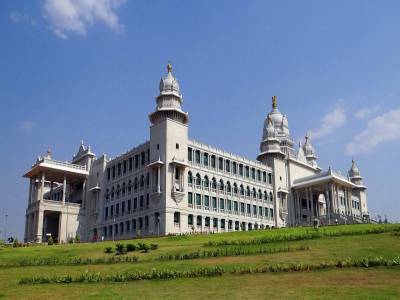 The Suvarna Vidhana Soudha literally translates itself to Golden Legislative Assembly in English. 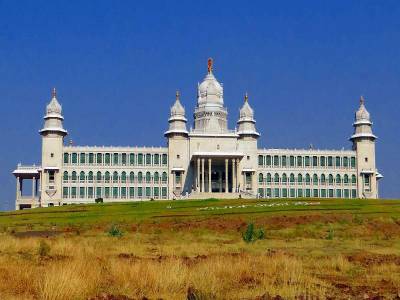 It is the building for the legislative assembly of Karnataka in Belgavi in the Belgaum district of Northern Karnataka. The building was given the Suvarna prefix for two main reasons. On the surface, the building structure marks the golden jubilee of the formation of the state of Karnataka and concealed significance of this massive structure built in 2012 was the Karnataka government’s attempt to reiterate its control of the disputed district of Belgaum which was also claimed by Maharashtra under its state legislation. The building housing the state legislation is a massive four storeyed structure spread across a massive sixty thousand four hundred square feet of area and boasts of a seating capacity of 300 legislators in the Legislative Assembly Hall and 100 Council members in the Councillor's Assembly hall along with a 45 seating capacity Central hall with thirty eight ministerial chambers and fourteen meeting halls. 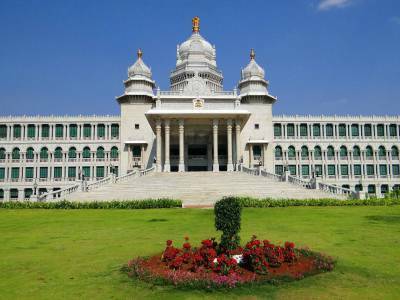 Apart from this the building structure of the Suvarana Vidhana Soudha also has provisions for conference halls, banquet halls, upper and lower and meeting halls, secretariats for both the houses of legislature, and office accommodations with state of the art facilities and best amenities. 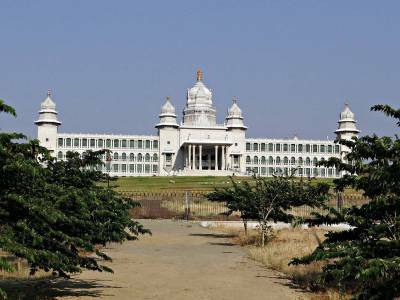 It is no less than a palace for the royals, boasting of staffing and functionalities no less than a five star luxury hotel. This massive piece of architecture is a contemporary iconic landmark and the entire campus is spread over a sprawling 127 acres of land. The face of the building has the inscription from famous 12th century poet Basavanna, Kayakave Kailas which means Work is Worship. At the very helm of the monument is a dome perched atop which is the Ashok Chakra which is the symbol of the India state, weighing almost up to eight tonnes. 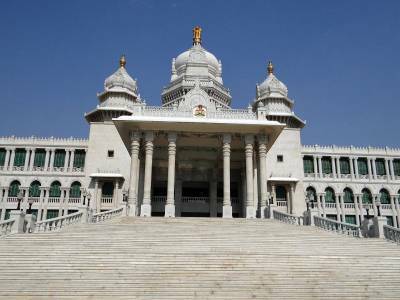 Get quick answers from travelers who visit to Suvarna Vidhana Soudha.